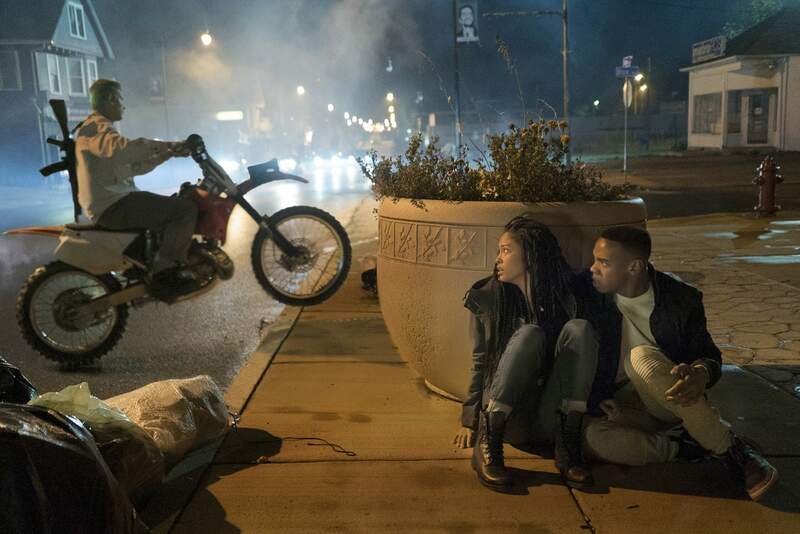 Nya (Lex Scott Davis) and Isaiah (Joivan Wade) hide from Purgers in “The First Purge. Since the original 2013 “Purge” film, the franchise has struggled to develop its undeniably intriguing premise: What would happen if all crime, including murder, was legal every year for 12 hours? By taking the franchise to its infancy with “The First Purge,” the film can better explore the implications of its premise. The result is an unabashedly violent B-movie throwback, the sort director John Carpenter used to make, with moments that resonate with real life. Unlike the other “Purge” films, in which crime is legal all over the country, “The First Purge” localizes the anarchy to Staten Island. The hard-right party the New Founding Fathers of America (NFFA) hopes this trial is a success, resulting in a reduction in crime and government assistance programs. The experiment’s architect is Dr. Updale (Marisa Tomei), an academic who thinks widespread catharsis could have positive psychological outcomes. Both the NFFA and Updale seem naive, and yet “The Purge” persists on an unassailable idea: No one knows what they’re capable of when they’re desperate. Director Gerard McMurray and screenwriter James DeMonaco – who wrote all previous “Purge” films – introduce us to Dmitri (Y’lan Noel), a drug dealer with a conscience, and his ex, Nya (Lex Scott Davis), an anti-Purge demonstrator, who live in a tight-knit community on Staten Island. Nya plans to hunker down during the Purge, but her younger brother Isaiah (Joivan Wade) wants to take advantage of the incentives offered by NFFA to anyone who willingly “purges,” including $5,000 for wearing contact lenses that double as cameras, and even more cash for committing violent crimes. When Isaiah finds himself in danger, Dmitri and Nya come to the rescue. The NFFA introduces widespread surveillance to Staten Island, enabling Updale to monitor the Purge’s progress. At first, people just want to loot and party, so the NFFA adds violent elements that promote crime – a brilliant plot turn that caters to bloodlusty horror fans and creates an expectation of chaos. As the NFFA inflates the threat of danger, it’s easy to root for the sympathetic characters trapped within the confines of the experiment, most especially the soft-spoken Dmitri. Even non-news junkies will recognize some of the influences on “The First Purge.” All over the island, white men wear khakis and carry tiki torches. Others put on Ku Klux Klan hoods or exaggerated costumes that resemble SS uniforms. When Nya fends off an attacker who had groped her, she repurposes a line from President Trump’s “Access Hollywood” tape. The contemporary references don’t distract from the fact that this remains a “Purge” film, in which horror and action mix: Before long, Dmitri is going to his well-stocked arsenal of guns and smoke grenades, and Staten Islanders are finding ways to defend themselves however they can. The last 30 minutes of “The First Purge” is a suspenseful, large-scale battle, confidently executed by McMurray, who creates a sense of uncertainty without ever losing control. (His take on the action can also be oddly cathartic: At a recent screening, the crowd hooted every time a bad guy was killed.) Newcomer Noel handles the over-the-top scenes with ease – including a bravura fight sequence among several neo-Nazis on a staircase – proving he has the chops to become an action star. This may be the fourth “Purge” film, but it’s the first that genuinely addresses some of the anxieties and frustrations unfolding in today’s America, albeit in its own dystopian, hyperbolized fashion. By the time the end credits roll for this vicious, nasty crowd-pleaser, with Kendrick Lamar playing over the soundtrack, you may just feel purged of your anger.